The eleventh season of American Idol premiered on Fox on January 18, 2012. The show aired on Wednesdays and Thursdays at 8/7c. Ryan Seacrest returned as host, while Randy Jackson, Steven Tyler, and Jennifer Lopez all returned as judges. Interscope Records Chairman Jimmy Iovine, a songwriter and producer, also returned as an in-house mentor to work with the contestants on a weekly basis. This season followed the same format as season 10, although a new title screen and logo were created, with a different font. Tyler and Lopez announced that they would be leaving the show two months after the finale. Lopez later returned as a judge for the show's thirteenth season. Phillip Phillips (born September 20, 1990) is from Leesburg, Georgia. He attended Lee County High School. He graduated Albany Technical College, but had to miss the graduation ceremony due to being on American Idol. He auditioned in North Charleston, singing "Superstition" by Stevie Wonder and Michael Jackson's "Thriller" with the guitar. He performed "I Only Have Eyes For You" with Heejun Han, Neco Starr, and Jairon Jackson during Hollywood Week. Many people have compared his vocal style to that of Dave Matthews, whom he has also noted as an influence. Phillips was announced the winner on May 23. Philips' coronation song, "Home", was a success with sales of 5.4 million copies in the United States. In this season, maintaining the previous season's format, there were 12 weeks of the finals and 13 finalists, with one finalist eliminated per week based on the American public's votes (exceptions include Top 13-week, where the judges were able to decide who would go home based on the lowest votes between the male and female contestants, and Top 12-week, where Jermaine Jones was disqualified). Previous season's winner Scotty McCreery recorded the Tim McGraw song "Please Remember Me" as the send-off song played when a contestant is eliminated. Jimmy Iovine resumed duties as a weekly mentor to the contestants, frequently assisted by guest mentors. This season, the fashion designer Tommy Hilfiger and Soyon An were employed as image advisers for the Top 10 finalists. Each contestant performed two songs: a Billboard number-one hit from the 21st century and a song from the classic soul era. Normally two finalists would be eliminated the week after using the judges' save. ^Note 1 : The 'Top 13' results featured 'Bottom 3' groups for each gender, with Testone and Rosado receiving the fewest votes among their respective genders. The judges subsequently opted to save Testone, thereby eliminating Rosado from the competition. ^Note 2 : Jones was disqualified for failing to disclose his full criminal history prior to the voting rounds commencing. ^Note 3 : Due to the judges using their one 'Judges' Save' per season, in order to save Sanchez, the 'Top 7' remained intact for another week. 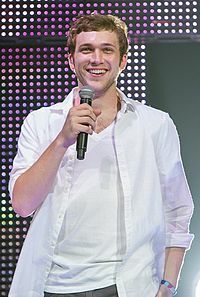 Phillip Phillips became the fifth consecutive white male to win the show, which led to some viewers and critics accusing American Idol of having gender and ethnic biases. The bias towards the so-called "white guy with guitar" (WGWG) has been widely commented on before and after the result was known, with some complaining about the predictability of the likely winner. The string of white guitar-playing male winners includes David Cook, Kris Allen, Lee DeWyze, and Scotty McCreery who won seasons 7, 8, 9, and 10 respectively. Just hours before the finale, Richard Rushfield, author of the book American Idol: The Untold Story, said, "You have this alliance between young girls and grandmas and they see it, not necessarily as a contest to create a pop star competing on the contemporary radio, but as…who’s the nicest guy in a popularity contest," he says, "And that has led to this dynasty of four, and possibly now five, consecutive, affable, very nice, good-looking white boys." Baylie Brown previously auditioned for season 6, but was cut during the groups round of Hollywood Week. Runner-up Jessica Sanchez competed on the first season of America's Got Talent in the Wildcard round. Finalist Heejun Han competed on the third season of K-pop Star under the name "Han Heejun", reaching the top six. Candice Glover – auditioned in Savannah, cut on the performance challenge in the Las Vegas rounds, and won the twelfth season. Schyler Dixon is the younger sister of finalist Colton Dixon. She was cut during the Las Vegas round of this season. It is unknown on which round she was cut in season 10. Finalist Shannon Magrane is the daughter of former MLB pitcher/broadcaster Joe Magrane. ^ "Fox (Finally) Announces Mid-Season Schedule: 'Touch' & 'Alcatraz' Will Share Mondays at 9pm – Ratings". TV by the Numbers. December 1, 2011. Retrieved December 5, 2011. ^ "Ryan Seacrest Confirms He Will Return To Host 'Idol' in 2012 on 'Leno' [VIDEO]". Ryan Seacrest.com. May 18, 2011. Retrieved December 5, 2011. ^ "They're Back! Two American Idol Judges Sign On to Return—So Who's the Lone Holdout?". E!. June 29, 2011. Retrieved December 5, 2011. ^ "Fox says Jennifer Lopez back for 'American Idol'". Reuters. August 17, 2011. Retrieved July 13, 2012. ^ Nigel Lythgoe Says No Big Changes Planned for 'American Idol' (VIDEO). Aoltv.com. Retrieved 2012-05-27. ^ "American Idol season 11 Winner is Phillip Phillips! - BeautyMania.Biz". May 23, 2012. Retrieved May 23, 2012. ^ "Season 11 Auditions – Show and Alumni News". American Idol. May 12, 2011. Retrieved December 5, 2011. ^ "Charleston – Season 11 Auditions". American Idol. Retrieved December 5, 2011. ^ "Okay, now it's official: Christina Aguilera back on 'Idol'". Blogs.ajc.com. Archived from the original on October 23, 2012. Retrieved December 5, 2011. ^ Mafera, Cate. "Ryan Seacrest, 'American Idol' land in Savannah". Savannahnow.com. Retrieved December 5, 2011. ^ "Pittsburgh – Season 11 Auditions". American Idol. Retrieved December 5, 2011. ^ "San Diego – Season 11 Auditions". American Idol. Retrieved December 5, 2011. ^ "American Idol: San Diego Auditions". Myfoxla.com. October 10, 2011. Retrieved December 5, 2011. ^ "Denver – Season 11 Auditions". American Idol. Retrieved December 5, 2011. ^ Janet Urquhart (September 28, 2011). ""American Idol" coming to Aspen". The Aspen Times, reprinted in The Denver Post. Retrieved September 28, 2011. ^ "Wannabe stars align for 'American Idol' in Aspen". Aspentimes.com. October 7, 2011. Retrieved December 5, 2011. ^ "Houston – Season 11 Auditions". American Idol. Retrieved December 5, 2011. ^ "Idol judges hope female talent shines in Texas". Houston Chronicle. August 30, 2011. Retrieved December 5, 2011. ^ "Portland – Season 11 Auditions". American Idol. Retrieved December 5, 2011. ^ Michael Becker/FOX (October 2, 2011). "'American Idol' comes to Portland: Jennifer Lopez, Steven Tyler, Randy Jackson and Ryan Seacrest talk about local auditions". The Oregonian. Retrieved December 5, 2011. ^ "St. Louis – Season 11 Auditions". American Idol. Retrieved December 5, 2011. ^ "'American Idol' returns for audition Round 2". Stltoday.com. September 3, 2011. Retrieved December 5, 2011. ^ "East Rutherford – Season 11 Auditions". American Idol. Retrieved December 5, 2011. ^ "Nigel Lythgoe OBE on Twitter". twitter.com. ^ "American Idol Auditions End This Week? (Schedule Change!)". February 1, 2012. ^ American Idol" to Hold Auditions in East Rutherford, New Jersey Thursday, September 22. Thefutoncritic.com. Retrieved 2012-05-27. ^ Idol Craze: Hundreds at Izod Center for 'American Idol' auditions. Bergen.com (September 22, 2011). Retrieved 2012-05-27. ^ Alex Wong. Americanidol.com. Retrieved 2012-05-27. ^ "American Idol": Jim Carrey's daughter out, and then disaster. Cbsnews.com (February 9, 2012). Retrieved 2012-05-27. ^ TCA: 'American Idol' Judges, Producers Bash the Competition. Hollywoodreporter.com. Retrieved 2012-05-27. ^ "Baylie Brown Birthday". February 22, 2012. ^ "Hallie Day Birthday". February 25, 2012. ^ "Jen Hirsh Birthday". February 22, 2012. ^ "Haley Johnsen Birthday". February 22, 2012. ^ "Chelsea Sorrell Birthday". February 22, 2012. ^ "Brielle Von Hugel Birthday". February 25, 2012. ^ "Eben Franckewitz Birthday". February 22, 2012. ^ "'American Idol' Vocal Coach Debra Byrd Takes Live Show Leave (Exclusive)". The Hollywood Reporter. February 23, 2012. ^ "Jessica Sanchez Birthday". February 22, 2012. ^ "Skylar Laine Birthday". February 23, 2012. ^ Thompson, Bill (March 2, 2012). "Local musician Elise Testone advances to finals on 'American Idol'". The Post and Courier. Retrieved March 4, 2012. ^ a b Booth, Jared (October 19, 2011). "Elise Testone and the Freeloaders". Charleston City Paper. Retrieved March 4, 2012. ^ "Elise Testone: Killin It". Holy City Sinner. February 29, 2012. Retrieved March 4, 2012. ^ Thompson, Bill (February 15, 2012). "Local 'American Idol' contestant Elise Testone just wants to perform". Charleston Scene. Archived from the original on January 19, 2013. Retrieved March 4, 2012. ^ Lesemann, T. Ballard (October 19, 2011). "The winners of the 2011 City Paper Music Awards". Charleston City Paper. Retrieved March 4, 2012. ^ Lesemann, T. Ballard. "Best Tribute". Charleston City Paper. Retrieved March 4, 2012. ^ Gray, Stanfield (June 2011). "Sound Control". Charleston Magazine. Archived from the original on April 23, 2012. Retrieved March 5, 2012. ^ Serjeant, Jill (April 27, 2012). "Not my time to go, says ousted "Idol" Elise Testone". Reuters. Retrieved April 27, 2012. ^ "Colton Dixon Birthday". February 22, 2012. ^ "Erika Van Pelt Birthday". February 22, 2012. ^ "Shannon Magrane Birthday". February 25, 2012. ^ "American Idol Cast-Off Shannon Magrane Talks That Steven Tyler Moment On Anderson". Huffington Post. March 21, 2012. Retrieved April 27, 2012. ^ "Jermaine Jones of 'American Idol' does talk to his father, says his mother". March 8, 2012. Retrieved March 8, 2012. ^ a b Lisa de Moraes (March 15, 2012). "'American Idol': After Jermaine Jones is disqualified, who will go home?". The Washington Post. ^ "Tommy Hilfiger tranforms Erika Van Pelt, can't help Philip Phillips on 'American Idol'". Newsday. March 22, 2012. ^ Jermaine Jones disqualified from 'American Idol'. Content.usatoday.com (March 14, 2012). Retrieved 2012-05-27. ^ 'American Idol': Jermaine Jones disqualification captured on tape. What are the chances?!. Popwatch.ew.com (March 14, 2012). Retrieved 2012-05-27. ^ a b "Women win the week for 'Idol' downloads". USA Today. March 28, 2012. ^ Bubbling Under Hot 100 Singles. Billboard.com. Retrieved 2012-05-27. ^ a b Paul Grein (April 4, 2012). "Week Ending April 1, 2012. Songs: A Teen-Tastic Top 10". Chart Watch. Yahoo Music. ^ a b Mansfield, Brian (April 4, 2012). "'Don't You Wanna Stay' passes 2 million downloads". Idol Chatter. Retrieved April 4, 2012. ^ "Week Ending April 8, 2012. Songs: Newcomers Beat Superstars | Chart Watch (NEW) – Yahoo! Music". Yahoo! Music. April 11, 2012. ^ "'Idol' track sales: Kelly Clarkson and more". USA Today. April 11, 2012. Retrieved April 21, 2012. ^ a b Paul Grein (April 11, 2012). "Week Ending April 8, 2012. Songs: Newcomers Beat Superstars". Chart Watch. Yahoo Music. ^ "Jennifer Hudson Chart History". Billboard. Retrieved May 23, 2012. ^ a b "Idols boost Idols with 'Idol' performances". USA Today. April 18, 2012. Retrieved April 21, 2012. ^ "'Idol' downloads: Clarkson, Underwood, Lambert". USA Today. April 25, 2012. Retrieved April 27, 2012. ^ Mansfield, Brian (May 2, 2012). "Clarkson, Underwood dominate 'Idol' track sales". Idol Chatter. Retrieved May 3, 2012. ^ "US Singles Top 100 – Saturday January 28, 2012". ^ "Billboard - Music Charts, News, Photos & Video". billboard.com. ^ "Kelly Clarkson hits 3 million for 'Stronger' single". USA TODAY. May 10, 2012. Retrieved May 11, 2012. ^ a b "'Idol' performance boosts J-Lo's sales". USA TODAY. May 17, 2012. Retrieved May 17, 2012. ^ Trust, Gary (May 18, 2012). "Chart Moves: Jennifer Lopez's 'Dance Again' Rebounds, 2Chainz's 'No Lie' Debuts on Hot 100". Billboard. Retrieved May 19, 2012. ^ a b c d Mansfield, Brian (May 30, 2012). "Phillip Phillips puts up big 'Home' numbers". Idol Chatter. Retrieved May 30, 2012. ^ a b Paul Grein (May 30, 2012). "Week Ending May 27, 2012. Songs: Bieber's Transitional Hit". Chart Watch. Yahoo Music. ^ Trust, Gary (May 30, 2012). "Phillip Phillips Storms Hot 100's Top 10, Gotye Has Year's Longest-Running No. 1". Chart Beat. Retrieved May 30, 2012. ^ Beth DeFalco (March 15, 2012). "Cops: Wasn't worth chasing 'Idol' on small charges". Seattle Post-Intelligencer. Associated Press. ^ "Jermaine Jones speaks on 'Idol' exit". The Marquee Blog. CNN. March 16, 2012. ^ Jennifer Lopez's 'Dance Again' Video Slammed By Right Wing Group (VIDEO). Huffingtonpost.com (April 9, 2012). Retrieved 2012-05-27. ^ Jennifer Lopez's 'Dance Again' Video Stirs Controversy: Her Five Trashiest Videos. Ibtimes.com (April 9, 2012). Retrieved 2012-05-27. ^ "New Video: Jennifer Lopez Featuring Pitbull, 'Dance Again'". MTV. March 30, 2012. Retrieved April 12, 2012. ^ Masley, Ed. "Was J.Lo video too steamy for 'family-friendly' 'American Idol?'". The Arizona Republic. Retrieved April 27, 2012. ^ Derrik J. Lang (May 18, 2012). "Will another white guitar guy win 'Idol'?". Chicago Sun-Times. ^ Laura Prudom (May 24, 2012). "'American Idol': Why Phillip Phillips and the White Guy With Guitar Trend Are Bad For Business". Huffington Post. Retrieved May 27, 2012. ^ "Phillip Phillips Continues Worrying Trend Of 'White Guy With Guitar' Winners For 'American Idol'". Star Pulse. May 24, 2012. Retrieved May 30, 2012. ^ a b Herbert, Steven (January 25, 2012). "Fox wins with 'American Idol' and football". The Orange County Register. Retrieved February 10, 2012. ^ Andreeva, Nellie (May 24, 2012). "Full 2011–2012 TV Season Series Rankings". Retrieved May 25, 2012. ^ Gorman, Bill (January 19, 2012). "Wednesday Final Ratings: 'American Idol,' 'Modern Family' Adjusted Up; 'Are You There, Chelsea?,' 'The Middle' Adjusted Down". TV by the Numbers. Retrieved January 19, 2012. ^ Thursday Final Ratings: 'Big Bang Theory' Tops 'American Idol' 1st Half Hour; 'Office,' 'Mentalist,' 'Grey's' Adj. Up; 'Person,' 'Rob,' 'Parks' Adj. Down. Tvbythenumbers.zap2it.com (January 20, 2012). Retrieved 2012-05-27. ^ Seidman, Robert (January 24, 2012). "Fox Moves Into Season Lead, Outrates Other Four Networks Combined". TVbytheNumbers. Retrieved January 31, 2012. ^ Seidman, Robert (January 26, 2012). "Wednesday Final Ratings: 'American Idol,' 'Criminal Minds,' 'CSI' Adjusted Up". TVbytheNumbers. Retrieved January 27, 2012. ^ a b c Gorman, Bill (January 31, 2012). "TV Ratings Broadcast Top 25: 'American Idol,' 'Big Bang Theory' Top Week 19". TVbytheNumbers. Retrieved January 31, 2012. ^ Seidman, Robert (January 27, 2012). "Thursday Final Ratings: 'The Big Bang Theory' Adjusted Up to Thursday High; 'American Idol' Up; 'The Finder' Adjusted Down". TVbytheNumbers. Retrieved January 28, 2012. ^ Gorman, Bill (February 2, 2012). "Wednesday Final Ratings: 'American Idol' Adjusted Up; 'Mobbed,' 'Super Bowl's Greatest Commercials' Adjusted Down". TVbytheNumbers. Archived from the original on February 5, 2012. Retrieved February 2, 2012. ^ a b Seidman, Robert (February 7, 2012). "TV Ratings Broadcast Top 25: 'Super Bowl,' 'The Voice' Top Week 20". TVbytheNumber. Archived from the original on November 20, 2014. Retrieved February 7, 2012. ^ Gorman, Bill (February 3, 2012). "Thursday Final Ratings: 'American Idol,' 'Big Bang Theory,' 'Grey's Anatomy,' 'Office,' 'Mentalist' Adjusted Up; 'Rob' Adjusted Down". TVbytheNumbers. Archived from the original on February 5, 2012. Retrieved February 3, 2012. ^ Seidman, Robert (February 9, 2012). "Wednesday Final Ratings: 'American Idol,' 'Suburgatory' Adjusted Up; 'Happy Endings,' 'CSI,' 'SVU,' Among Many Downward Adjustments". TVbytheNumbers. Archived from the original on March 28, 2013. Retrieved February 10, 2012. ^ a b Gorman, Bill (February 14, 2012). "TV Ratings Broadcast Top 25: 'Grammy Awards,' 'The Voice,' 'The Big Bang Theory' Top Week 21". TVbytheNumber. Archived from the original on June 26, 2012. Retrieved 2012-02-15. ^ Seidman, Robert (February 10, 2012). "Thursday Final Ratings: 'The Big Bang Theory,' 'American Idol,' 'Grey's Anatomy,' 'The Mentalist,' 'Vampire Diaries' Adjusted Up; 'Rob,' 'Private Practice,' 'The Finder,' 'Up All Night' Adjusted Down". TVbytheNumbers. Archived from the original on February 13, 2012. Retrieved February 10, 2012. ^ Kondolojy, Amanda (February 16, 2012). "Wednesday Final Ratings: 'American Idol,' 'One Tree Hill,' 'Survivor,' 'Whitney,' & 'Criminal Minds' Adjusted Up, 'The Middle,' 'CSI,' 'Rock Center,' & 'Happy Endings' Adjusted Down". TVbytheNumber. Archived from the original on May 15, 2013. Retrieved February 17, 2012. ^ a b Seidman, Robert (February 22, 2012). "TV Ratings Broadcast Top 25: 'American Idol,' 'The Voice,' 'The Big Bang Theory' and 'NCIS' Top Week 22". TVbytheNumber. Archived from the original on June 11, 2012. Retrieved 2012-02-22. ^ Gorman, Bill (February 17, 2012). "Thursday Final Ratings: 'American Idol,' 'Vampire Diaries,' 'Grey's Anatomy,' 'Big Bang Theory,' '30 Rock,' 'Office' Adjusted Up; 'Person Of Interest,' 'Mentalist,' 'Secret Circle' Adjusted Down". TVbytheNumber. Archived from the original on April 10, 2012. Retrieved 2012-02-17. ^ Bibel, Sara (February 23, 2012). "Wednesday Final Ratings: 'Modern Family,' 'CSI,' 'One Tree Hill' Adjusted Up, 'The Middle,' 'Happy Endings' Adjusted Down". TVbytheNumber. Archived from the original on February 27, 2012. Retrieved February 25, 2012. ^ a b Kondolojy, Amanda (February 28, 2012). "TV Ratings Broadcast Top 25: 'Academy Awards' Towers Over The Week, 'Big Bang Theory' Is Top Scripted Show". TVbytheNumber. Archived from the original on June 10, 2012. Retrieved 2012-02-29. ^ Bibel, Sara (February 24, 2012). "Thursday Final Ratings: 'Big Bang Theory,' 'American Idol,' 'The Mentalist' Adjusted Up; 'Rob,' 'Private Practice,' 'Up All Night' Adjusted Down". TVbytheNumber. Archived from the original on February 27, 2012. Retrieved February 26, 2012. ^ Tuesday Final Ratings: 'American Idol,' 'NCIS,' 'Last Man Standing,' 'Body Of Proof' & 'Cougar Town' Adjusted Up Archived February 29, 2012, at the Wayback Machine. Tvbythenumbers.zap2it.com (February 29, 2012). Retrieved 2012-05-27. ^ a b c Seidman, Robert (March 6, 2012). "TV Ratings Broadcast Top 25: 'The Voice,' 'American Idol,' 'Modern Family,' NCIS Top Week 24". TVbytheNumbers. Retrieved March 7, 2012. ^ Kondolojy, Amanda (March 1, 2012). "Wednesday Final Ratings: 'American Idol' Adjusted Up; 'Suburgatory,' 'America's Next Top Model' & 'Happy Endings' Adjusted Down". TV by the Numbers. Retrieved March 2, 2012. ^ Kondolojy, Amanda (March 2, 2012). "Thursday Final Ratings: 'Awake' & 'American Idol' Adjusted Up". TV by the Numbers. Retrieved March 3, 2012. ^ Bibel, Sara (March 8, 2012). "Wednesday Final Ratings: 'American Idol' Adjusted Up". TVbytheNumbers. Retrieved March 8, 2012. ^ a b Kondolojy, Amanda (March 13, 2012). "TTV Ratings Broadcast Top 25: 'The Voice,' 'American Idol,' 'Big Bang Theory' Top Week 25 Ratings". TV by the Numbers. Retrieved March 13, 2012. ^ Bibel, Sara (March 9, 2012). "Thursday Final Ratings: 'American Idol' Adjusted Up; 'Parks & Recreation' Adjusted Down". TVbytheNumbers. Retrieved March 10, 2012. ^ Kondolojy, Amanda (March 15, 2012). "Wednesday Final Ratings: 'American Idol', 'Survivor: One World', 'CSI', 'One Tree Hill', 'Are You There, Chelsea?' & 'Modern Family' Adjust Up". TVbytheNumbers. Retrieved March 16, 2012. ^ a b Bibel, Sara (March 22, 2012). "TV Ratings Broadcast Top 25: 'American Idol,' 'The Voice,' 'Modern Family' Top Week 26 Ratings". TVbytheNumbers. Retrieved March 20, 2012. ^ Kondolojy, Amanda (March 16, 2012). "Thursday Final Ratings: 'American Idol', 'The Office', 'Missing' Adjusted Up, 'Private Practice' Adjusted Down + NCAA Game Ratings". TVbytheNumbers. Retrieved March 16, 2012. ^ Biebel, Sara (March 23, 2012). "Wednesday Final Ratings: 'American Idol,' 'Survivor,' 'CSI,' 'One Tree Hill' Adjusted Up; 'Bent' Adjusted Down". TVbytheNumbers. Retrieved March 23, 2012. ^ a b Kondolojy, Amanda (March 27, 2012). "TV Ratings Broadcast Top 25: 'American Idol', 'NCIS' Top Week 27 Ratings". TVbytheNumbers. Retrieved March 27, 2012. ^ Seidman, Robert (March 24, 2012). "Thursday Final Ratings: 'American Idol,' 'Touch,' '30 Rock,' 'Up All Night' Adjusted Up". TVbytheNumbers. Retrieved March 23, 2012. ^ Kondolojy, Amanda (March 29, 2012). "Wednesday Final Ratings: 'Idol', 'Survivor' 'One Tree Hill' and 'Whitney' All Adjusted Up". TVbytheNumbers. Retrieved March 30, 2012. ^ a b Bibel, Sara (April 3, 2012). "TV Ratings Broadcast Top 25: NCAA, 'American Idol,' 'The Voice,' 'Big Bang Theory' and 'NCIS Top Week 28 Viewing". TVbytheNumbers. Retrieved April 7, 2012. ^ Kondolojy, Amanda (March 30, 2012). "Thursday Final Ratings: 'American Idol',"The Big Bang Theory', 'Missing' and 'Vampire Diaries' Adjusted Up, 'Rules' and 'Touch' Adjusted Down". TVbytheNumbers. Retrieved April 1, 2012. ^ Bibel, Sara (April 5, 2012). "Wednesday Final Ratings: 'American Idol', 'Happy Endings', 'Survivor' Adjusted Up; 'Bent' Adjusted Down". TVbytheNumbers. Retrieved April 6, 2012. ^ a b Bibel, Sara (April 10, 2012). "TV Ratings Broadcast Top 25: 'American Idol,' 'Big Bang Theory', 'The Voice,'and 'Person of Interest' Top Week 29 Viewing". VbytheNumbers. Retrieved April 12, 2012. ^ Bibel, Sara (April 6, 2012). "Thursday Final Ratings: 'Big Bang Theory', 'American Idol', 'Person of Interest', 'Missing', 'Up All Night' Adjusted Up; 'Scandal' Adjusted Down". TVbytheNumbers. Retrieved April 6, 2012. ^ a b Kondolojy, Amanda (April 17, 2012). "TV Ratings Broadcast Top 25: 'American Idol', 'NCIS' Top Week 30 Viewing". TVbytheNumbers. Retrieved April 18, 2012. ^ Kondolojy, Amanda (April 19, 2012). "Wednesday Final Ratings: 'American Idol', 'SVU', 'Survivor', 'Modern Family' Adjusted Up; 'Off Their Rockers, 'Best Friends Forever', 'Rock Center' Adjusted Down". TV by the Numbers. Retrieved April 19, 2012. ^ a b Kondolojy, Amanda (April 24, 2012). "TV Ratings Broadcast Top 25: 'American Idol', 'Modern Family' Top Week 31 Viewing". TVbytheNumbers. Retrieved April 24, 2012. ^ Kondolojy, Amanda (April 20, 2012). "Thursday Final Ratings: 'American Idol', 'Grey's Anatomy', 'Awake' & 'Missing' Adjusted Up; 'Scandal' & 'Parks and Recreation' Adjusted Down". TV by the Numbers. Retrieved April 20, 2012. ^ Kondolojy, Amanda (April 26, 2012). "Wednesday Final Ratings: 'American Idol', 'SVU', 'Survivor', 'Off Their Rockers', & 'Revenge' Adjusted Up". TV by the Numbers. Retrieved April 26, 2012. ^ a b Bibel, Sara (May 2, 2012). "TV Ratings Broadcast Top 25: 'American Idol', 'Big Bang Theory' Top Week 32 Viewing". TVbytheNumbers. Retrieved May 1, 2012. ^ Kondolojy, Amanda (April 27, 2012). "Thursday Final Ratings: 'Idol', 'Big Bang Theory', 'Grey's', 'The Vampire Diaries', 'Mentalist' & 'Missing' Adjusted Up; 'Scandal' Adjusted Down". TV by the Numbers. Retrieved April 27, 2012. ^ Kondolojy, Amanda (May 3, 2012). "Wednesday Final Ratings: 'American Idol', 'SVU', 'Survivor', 'Modern Family', & 'ANTM' Adjusted Up, 'Don't Trust the B' Adjusted Down". TV by the Numbers. Retrieved May 3, 2012. ^ a b Kondolojy, Amanda (May 13, 2012). "TV Ratings Broadcast Top 25: 'American Idol', 'The Big Bang Theory' & 'NCIS' Top Week 33 Viewing". TVbytheNumbers. Retrieved May 8, 2012. ^ Kondolojy, Amanda (May 4, 2012). "Thursday Final Ratings:'The Big Bang Theory', 'American Idol', 'Vampire Diaries', 'Grey's Anatomy,' 'Mentalist', Adjusted Up; 'Secret Circle','Scandal' Adjusted Down". TV by the Numbers. Retrieved May 4, 2012. ^ Kondolojy, Amanda (May 10, 2012). "Wednesday Final Ratings: 'Idol', 'SVU', 'Modern Family', 'Survivor', & 'Criminal Minds' Adjusted Up; 'Off Their Rockers', 'Rock Center' Adjusted Down". TV by the Numbers. Retrieved May 11, 2012. ^ a b Bibel, Sara (May 16, 2012). "TV Ratings Broadcast Top 25: 'American Idol' & 'NCIS' Top Week 34 Viewing". TVbytheNumbers. Retrieved May 15, 2012. ^ Bibel, Sara (May 17, 2012). "Wednesday Final Ratings:'American Idol', 'Criminal Minds', 'Off Their Rockers' Adjusted Up; 'Don't Trust the B' Adjusted Down". TV by the Numbers. Retrieved May 17, 2012. ^ a b Kondolojy, Amanda (May 22, 2012). "TV Ratings Broadcast Top 25: 'American Idol', 'NCIS' Top Week 35 Viewing". TVbytheNumbers. Retrieved May 26, 2012. ^ Kondolojy, Amanda (May 23, 2012). "Tuesday Final Ratings: 'American Idol', 'DWTS', 'AGT' Adjusted Up, 'Glee' Adjusted Down". Retrieved May 23, 2012. ^ Kondolojy, Amanda (May 24, 2012). "Wednesday Final Ratings: 'Idol', 'Modern Family', & 'SVU' Adjusted Up, 'Apt 23' Adjusted Down". Retrieved May 24, 2012. ^ Seidman, Robert (January 25, 2012). "Tuesday Final Ratings: 'American Idol' Encore Adjusted Up; No Adjustments for '90210' or 'Remodeled'". TV. Retrieved January 31, 2012.